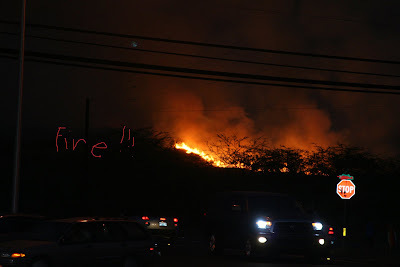 Liza's Eyeview: Fire Across The Street From Our House - Right Now! Fire Across The Street From Our House - Right Now! It started this afternoon. As we were turning on this road we noticed a thick smoke, and a police office closing the road. We found out the fire is a brush fire in the end of the street here in the subdivision we're in. Just as it was almost "contained" on this side, because of the strong wind, some "fire" crossed the highway and ignited some dry trees and bushes on the ranch across the highway. And so it's on fire at this very moment! UPDATE: The wind is moving to the direction away from our house so the fire is now far away from our house. Please pray for everyone's safety especially the firefighters who are all working so hard to contain the fire. i do hope its fire out now. you can see my weekly winners here! thanks. Yikes, looks scary! I do hope that everyone will be safe. How scary! Keeping everyone in my thoughts. Wow. Please be careful and stay safe. I'm glad you're o.k. Phew! Fire can be so frightening. Mel and I learned that firsthand. I'm glad it didn't come your way! Oh my gosh!! So frightening! Prayers for y'all's safety and everyone else who's been affected by this. YIKES I hope the fire is out now and no one was harmed. Oh No!! 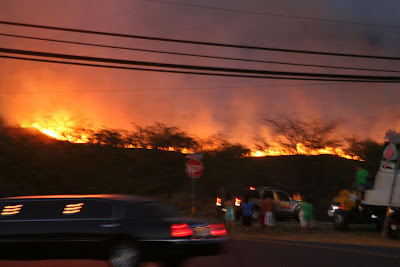 Hope the fire goes out soon & that everyone stays safe.